overhang the Provence from Antibes to Cannes. This garden, surrounded by a low boswood hedge laid out in Greek style, is devoted to medicinal plants used both for seasoning and garnishing food. In medievall times, il was called "The Apothecary's Garden" from the name given to the castle's doctor/pharmacist/herbalist. The range of plants occurring here is typical of those found in gardens dating from the period prior to the 1600's. balsamita major - asperula odorata - salvia sclarea - lilium martagon - ruta gnveolens - symphytum - ricinus - althaea rosea aquilegia - aquilegia and lall laurus nobilis trees in standatd form with the foliage at the top clipped to the shape of a ball. . 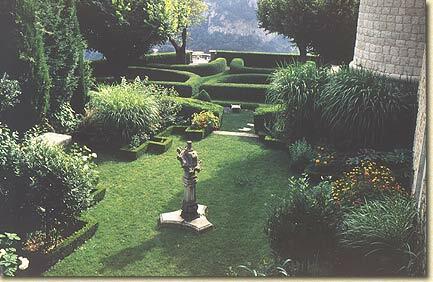 This main terrace was designed by Andre Le Notre who was landscape gardener to Louis XIV. It was he who designed the gardens at the château of Versailles. 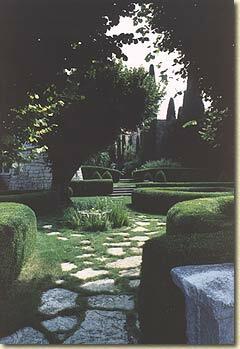 There are many impressive features here; a magnificent topiary garden in boxwood clipped into fascinating shapes - cylinders, gothicstyle arches, spheres and spirals especially the famous expanding spiral displayed at the Beaufou Mansion exhibition in Paris in 1993. In summer this terrace garden is shaded by tall linden trees. It offers a delightful bower of foliage from which one has a stunning view of the panorama below.